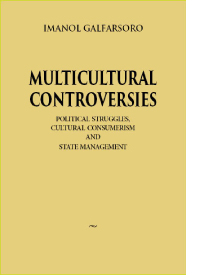 Title: Multicultural Controverseries: Political Struggles, Cultural Consumerism and State Management Author: Imanol Galfarsoro Imprint: The Davies Group, Publishers 204 pp. soft cover USD 26.00 ISBN 978-1934542446 Pub date: June 9, 2014 In this short but all-encompassing account of multiculturalism, Multicultural Controversies studies the emergence and development of multiculturalism as a concept mapped out through a variety of controversial discussions. Arguing that multiculturalism cannot be reduced just to the issues of emigration and religion, the author pursues a comprehensive approach reflecting a trans-disciplinary interest in the intersection of critical social theory and radical political philosophy with post-colonial studies, and examines the overall contexts (historical, socio-political, cultural and philosophical/speculative) in which multiculturalism emerges and develops as a concept. Table of Contents Acknowledgments Introduction Part I Multiculturalism as Struggle: Society Chapter 1 Culture is (not) ordinary Culture and community; Double consciousness; Structures of feeling Chapter 2 Hegemonic articulations Infinite dispersal & arbitrary closure; Discourse and constitutive exteriors; There is no society Part II Multiculturalism as Consumption: Market Chapter 3 Others for sale Indifference to difference; Ideological form of global capitalism; Boutique multiculturalism Chapter 4 “It’s the economy, stupid!” Tolerance and respect; Universal, particular, singular; The market (and the) economy Part III Multiculturalism as Management: State Chapter 5 Nation and Migration Border Theory; DissemiNations; Implicit assumptions Chapter 6 The State is death, long live the State! “Sophisticated” multiculturalism; Post-nationalisms; State of affairs Conclusion Endnotes Works Cited Index “Multicultural Controversies offers a totally fresh look at a complex subject. Imanol Galfarsoro views multiculturalism along three dimensions: struggle and society, consumption and the market, management and the state. It is an original and illuminating approach. This book, with its broad coverage and incisive analysis, is essential reading for anyone grappling with the question of multiculturalism today.” Dr. Brian Klug Senior Research Fellow & Tutor in Philosophy Oxford University “ Multicultural Controversies contributes an unparalleled genealogy of the problem of multiculturalism. At a time when intellectual discourse tends to forget yesterday’s debates and, consequently, keeps “reinventing” the same problems, Multicultural Controversies offers a forty-year history on the debates about the problem of cultural/racial/ethnic difference, while masterfully weaving this history with the more general philosophical debate of universalism/particularism in a very synthetic way.” Dr. Joseba Gabilondo Department of Romance and Classical Studies Michigan State University About thehe Author: Imanol Galfarsoro (Visiting Research Fellow at the School of Design, University of Leeds), PhD in Sociology and Social Policy, University of Leeds, UK, has written and published books, articles and collaborations on questions of cultural and national identity, migration, diaspora politics and subaltern/postcolonial thought.